Sarah Wiley was the oldest of child of Woody Wiley, a farmer. She was born free to a free family of color in Virginia February 2, 1841. Her mother, Susan Freeman Wiley, died before she was one year old. Her father married Sarah Daniels soon after. Nine more children were born. 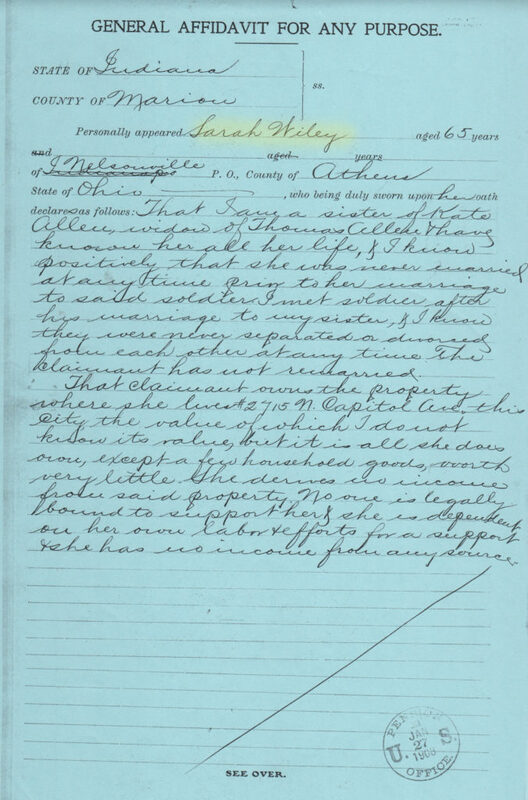 The extended Wiley family moved to Athens County Ohio, probably soon after the descriptions were taken in 1852. It is about 329 miles. I wonder how they traveled, but do not have time to investigate today! “After being taken over by the Disciples of Christ, Christian Church, the Albany Manual Labor Academy “refused further admission to the black community,” according to Getting to Know Athens County by Elizabeth Grover Beatty and Marjorie S. Stone. When Sarah was 25 years old, her youngest sister was born and her step-mother died. There were still six other children at home. Sarah stepped into the role of mother and housekeeper. In July 1873, her father Woody was suffering from consumption and made out his will. He left everything to the three children that were still alive and living at home, Sarah (31), Henry (18) and Armintha (12). Woody charged Sarah with seeing that Armintha received a good “common school” education and was taken care of materially. When Armintha was 22, she married William Green Simpson, a neighbor. Armintha died within the next few years and William married again. Sarah never married. Click to enlarge. Sarah states that she is Kate’s sister and that Kate has nothing aside from her house and goods and that no one is bound to support her. In 1908 Sarah gave testimony for her sister Kate Wiley Allen, who was trying to get her widow’s pension after her husband Thomas Ray Allen died. After Kate began to receive her pension, Sarah moved to Indianapolis and they shared Kate’s house for several years. They then returned to Ohio where Kate died in 1915. In 1920, Sarah was living with her former brother-in-law, William Green Simpson, who had been married to her younger sister Armintha. His youngest son was still at home. They were both coal miners. Sarah was the housekeeper. In 1924 William married a 3rd time, to Dora Parker, a widow with four children under ten. Sarah was 82. By 1928, Sarah was an inmate in the Columbus State Hospital, a mental hospital in Columbus Ohio. 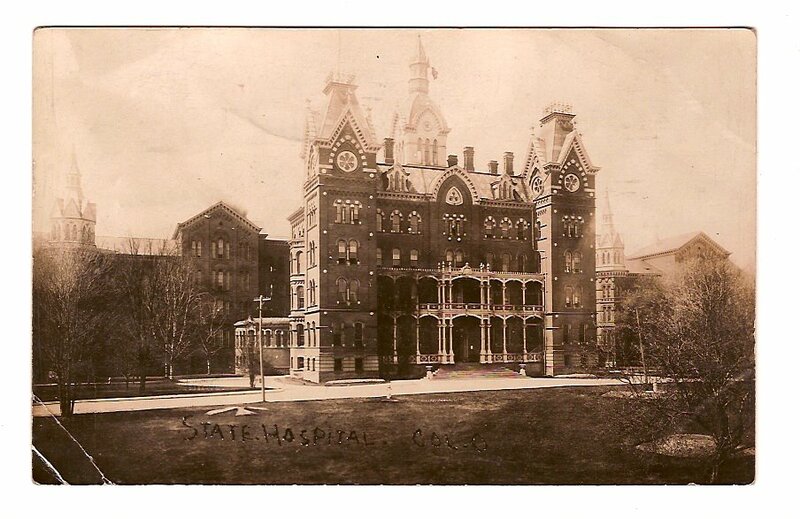 Sarah died in the State Hospital in 1932, of atherosclerosis. She was 93 years old. I found this information on ancestry.com, familysearch.org and places on the internet linked to above. Using the information that I found, it is easy to fill in the blanks to make a story. The problem is, I do not really know the ends and outs and the personalities and the reasons involved. I hope that I have, at least, gotten the “facts” right. Good work (as always), Kristin! A remarkable life for Sarah. The buildings look impressive for the time involved. This is one of my favourite links to Thomas Allen so far. I like those with lots of different kinds of information so this was one of my favorite too. I also tried to write it without saying in the 1900 census thus and so, but just use the information. A couple of times I did bring it in, but I think less than usual. I wondered too. Lot’s of old people ended up there. The records are sealed, of course. Nice Christian attitude of the church that took over the school! You are digging up the most fascinating stuff. Not at all unusual. The unusual part was black community members immediately starting a school themselves. How sad that a supposedly Christian church was so prejudiced to deny an education to certain children. It’s sad to read that a religious group took over the Albany Academy and banned black children. One would expect support from a religious organization. Fascinating stuff…and you seem to be doing such a good job with the genealogy. That is so sad and unfair the children were denied an education just because of the colour of their skin. Sarah seems to have led an eventful and long life. Fascinating to trace the ancestral journeys of generations previous! Denying black children an educaton was widespread and common and hasn’t completely disappeared today, in other forms. This story would do a nice novel, too. I’ve seen it many times in my own life, where one of the older daughter take care of the family and never have one of their own. It is simply duty to her family that keeps her going? I mean, Sarah was lived into her 90s so she had a full life, but did she ever feel that she missed anything? Also, the part that jumped out at me was that Sarah was 25 when her youngest sister was born. Now, it doesn’t say that her step mother started having children immediately after she married, but that’s a safe bet, right? So that means she was having kids for 24 YEARS? Even spacing them them out, she would have to been at LEAST 40 when the last one was born. She was a baby machine. Not a baby machine, a woman who had a lot of children and the having the last one probably killed her. She did have her first soon after marriage. Before birth control, and even after many women were over 40 when they had their last child. Sarah’s life reads like a novel. What s full life she seemed to have. Wonder if she was ever lonely? Looks like Disciples of Christ was a misnomer for the denomination that discriminated against the African-American community. Glad to learn an alternative academy was set up so children of color could continue to learn. Thanks so much for another insightful and well documented post!